The May 16 launch of Farpoint is quickly approaching, and we wanted to give you a preview of a new TV spot set to air nationwide this week. This is the latest spot in our “Two Worlds” campaign for PlayStation VR. As the name implies, this campaign brings together the real world and incredible gaming worlds — putting the player directly into the experience. If you’ve tried PlayStation VR, then you know how it can quickly transport you to another world. In the case of Farpoint, that means sending you to a distant planet filled with nasty space bugs (including giant spiders). PlayStation VR has been in high demand since launch, and we have heard from many of you that it has been a bit tricky to find on store shelves. We’ve been working to meet demand and are happy to report that PS VR is back in stock at many retailers in the U.S. and Canada. If you’ve been thinking about picking up a system, now is a great time to jump in. The library of PlayStation VR content continues to grow. Take a look at the list below for some of the exciting VR games on the horizon, and be sure to let us know what you think of the new spot! No, it’s actually not. Save money. Owned a PSVR since day one, worth EVERY penny. 2. Not sure how trying it is going to change the fact it costs too much. Trying it won’t make it priced differently. 3. So if I save money, the price somehow changes? Didn’t think so. It’s not a matter of not being able to afford it, it’s that it costs too much. As do many of the decent looking games for it. Enjoying it doesn’t make it not overpriced. Feeling you got your money’s worth doesn’t mean it isn’t overpriced either. Actually, people buying it and feeling like they got their money’s worth means, by definition, it is not overpriced — at least to them. Trying it may change your perceived value, which may change whether you not you think it may be worth the price they are asking. It’s always people who haven’t tried VR that don’t get it. And claiming $400-$500 is by default overpriced is grasping at straws when you know your wrong, by that definition anything over $500 would be overpriced for anything. I paid $500 day one for my at home holo-deck. After watching Star Trek as a kid I would’ve paid anything for one, a million if I had it, so half a grand was an easy call. @Peduzzi It’s like building a PC and buying a Oculus/Vive and calling it overpriced. Errrrr… that is kinda exactly what it means. Just admit that mom won’t buy it for you. Nope. Wrong. What Elvick said is completely true. People buy Louis Vuitton handbags. They enjoy them (I guess) and feel they got their money’s worth, but Louis Vuitton handbags are obscenely overpriced nonetheless. That’s just your opinion. I had been saving up since it was announced and could afford it twice over by the time I actually found one. There are plenty of things that provide far less an experience for a price greater than $500. Hold out for a price drop that you’re comfortable with and pick one up. You won’t regret it. My friend said the same thing until he try it at my place , he ordered one the next day. Just lol at people saying its not overpriced,damn lack of common sense…VR launched at the same price of the PS4 itself….how come an accessory that costs the same price of your console ain’t overpriced? Great TV spot. I know what you guys are going for, and you still have some of the best campaigns out there. But it would be cool to see some gameplay footage in the commercial. It’s not like the game looks bad, and it keeps people from complaining, which seems to be the popular thing to do right now. 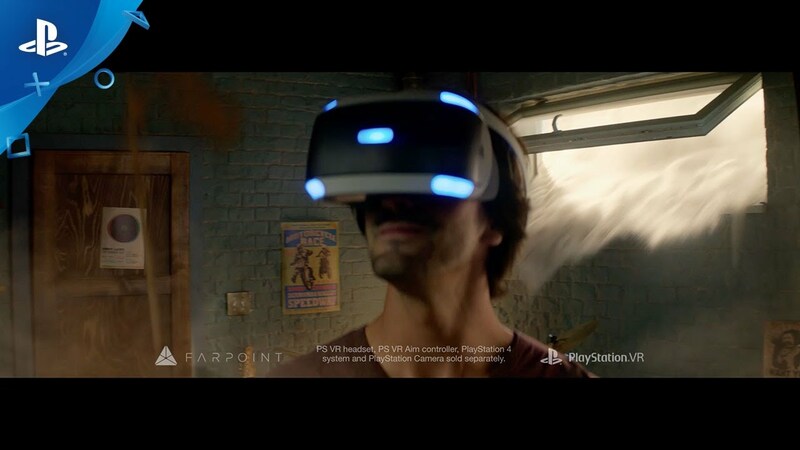 Great to see PSVR getting a TV commercial again. Farpoint looks awesome! With Resident Evil 7, Dirt Rally, and Star Trek: Bridge Crew in the mix, PSVR is really coming into it’s own. Loving it! PSVR was never “out of stock” here. I just don’t know anyone that wants to spend that much on a tech demo with limited “experiences”. Oh wait you must mean all those 10$-30$ games where for the price of a movie ticket worth 2 hours of entertainment I can be in the dinosaur land for 5 hours instead of looking at it on a screen for half that amount of time, yeah that must be it. I mean who would ever wanna be in Jurassic park when you could look at a flat screen instead. Yeah, buddy. It was out of stock, and people on Amazon were spiking up the prices because they weren’t available. Realize that the entire world doesn’t exist only around your situation, and that no knowing about something and bashing it doesn’t convince anyone to see your point. Look at the reviews on Amazon for the headset. You might dismiss it as a bunch of tech demos, but most people who own it are playing good games on it and visiting those experiences as a side thing. Hell, I just ordered a VR video camera that takes full 180 3D Stereoscopic VR video, and I can use the PSVR to watch it. It’s second only to being there. So no, Sony’s headset isn’t just for gaming. And if you’d like to stick to your TV, no one is stopping you, but if you believe games are a form of escapism and deny VR’s power, then you are the wrong kind of gamer. Please. I would have gladly paid $500 for the personal MOVIE THEATER that is PSVR. And 3D films?!? F. YES. As for Farpoint… I can’t wait to stand next to my British friends & kill aliens. I am still crossing my fingers that Sony doesn’t let PSVR just blow off into the wind. Although this TV ad gives hope, I am still cautious. That said, I am waiting on reviews but am definitely all but in on Farpoint! I absolutely loved the story trailer. I think Farpoint deserves support because is doing it right: relevant single player content, and a co-op multiplayer mode. Of course it would be nice to see a deathmatch multiplayer mode, but I guess multiplayer should never be a focus for a VR game since the install base is really small, the focus should be give something for players to do independent of the install base. This is a better way to release a VR game than games like Starblood Arena, Eagle Flight, that has no single player content, and we players are stuck with a matchmaking that can’t find matches. It undermines the consumer trust on the platform, and we will eventually stop buying it! – Stop releasing multiplayer VR focused games, they will be dead on arrival (like RIGS, Starblood Arena) people will stop supporting new games because they can’t find matches, why release games that depends on install base to work?! I’m wondering if Sony will consider making an aim controller bundle that includes a digital copy of Farpoint. The bundle is sold out on Amazon. But you can still get the bundle at BestBuy online. Thats some truly awesome TV Spot but why the damn letterbox?…ruined it. Does anyone know if it works whith the two moves?